Mike Tayeb is the Technical Support Manager at DNA Genotek Inc. In the past few years, there have been rapid and significant advancements in genotyping technologies. Microarrays, with their increase in reliability and decrease in price, have become a standard tool for interrogating known SNPs. Next generation sequencing, with its ability to detect rare and novel variants in addition to known variants, is experiencing rapid uptake in both research and clinical settings. Both of these technology types require a source of high quality DNA, such as saliva collected using Oragene self-collection kits. 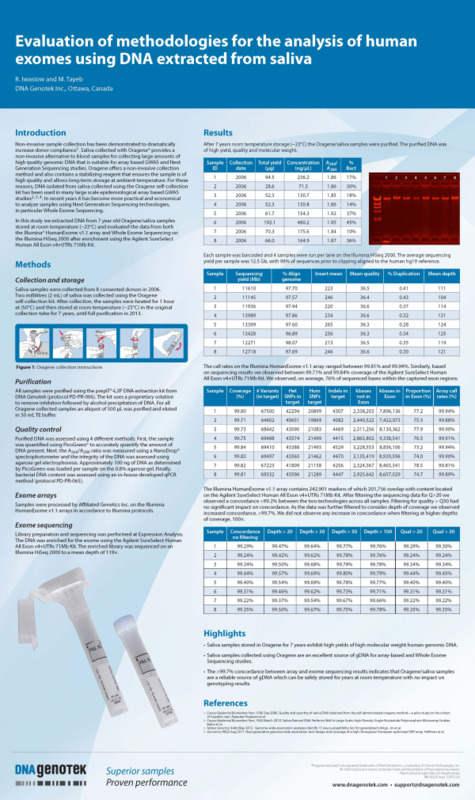 Recently, we presented some recent research findings at ESHG 2013 in Paris. In this article, I’ll discuss the results of a study, in which we compare the data generated from two different exome genotyping technologies in order to demonstrate both the stability and reliability of DNA from saliva collected using Oragene. For this study, we dipped into our long-term sample bank and selected saliva samples from eight donors. These samples were collected in 2006 using Oragene self-collection kits. After collection, the samples were heated at 50°C for 1 hour and then stored at room temperature for the next seven years. In early 2013, DNA was extracted from an aliquot of each sample using prepIT•L2P. DNA quantity and quality was assessed by Picogreen and agarose gel. The samples were first run on the Illumina HumanExome v1.1 arrays following the protocols supplied by Illumina. All eight samples, stored at room temperature for 7 years, generated call rates in excess of 99.8% on the arrays. We then went on to enrich the samples for the exome using Agilent’s SureSelect Human All Exon v4+UTRs (71 Mb) kit and sequenced the enriched libraries on the Illumina HiSeq 2000. Our mean sequencing depth was 119X and we obtained >99.7% coverage of the exome. On average, 76% of the bases sequenced fell within the captured exon regions. These results indicate excellent performance on both arrays and exome capture and sequencing. In order to further study the reliability of the samples, we went on to compare the results of the two technologies. By comparing the manufacturer-provided content lists, we determined that there were 201,756 markers that are common to both the Illumina HumanExome array and the Agilent SureSelect Human All Exon kit. For these common markers we observed a concordance of >99.2% (sequencing data filtered for Q>20) between the two technologies across all samples, indicating that Oragene/saliva samples stored at room temperature for many years still provide DNA that performs reliably in genotyping. Although the sample size is small, this study indicates that DNA extracted from Oragene/saliva samples performs well on both array- and sequencing-based technologies, and shows that Oragene enables the long-term storage of samples at room temperature. (It is interesting to note that neither of the genotyping technologies we used existed when these samples were collected.) The full poster provides the complete details on this study. You can have a look at that here. As always, I’d love to hear from you if you have comments on this study or questions regarding Oragene/saliva samples and your research. Just leave a comment below.